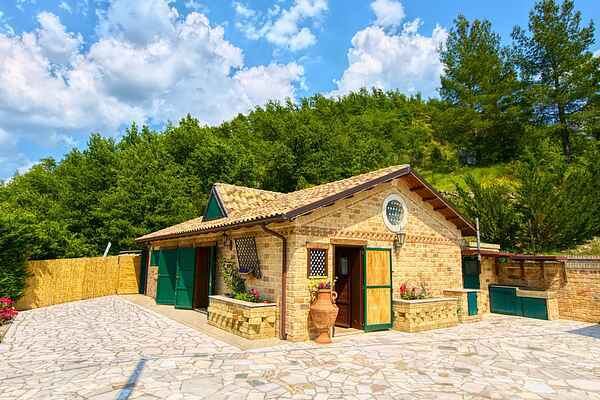 This completely restored country house is situated above Acqualagna, the truffle heart of Italy. The owner of this property will tell you all about it here. The location of the house allows you to enjoy the fantastic views over the village and the surrounding area. You have a beautiful view from the shared pool and also from your chair on your own terrace. The interior is done with care and provided with all comforts. In the garden is a barbecue and wood burning oven. This holiday huisw on the border between Umbria and Le Marche offers you the opportunity to relax wonderfully. For a more active holiday you're in the right place. Therefore the historical center of Acqualagna is at walking distance and other attractions are easily accessible. The owner also has a pony Stella and children may take a free ride on the pony! The sofa bed is suitable for children under 10 years.